Aloha! Come visit Stitch! He’s been spotted at the United Galactic Federation Stitch Tracking Station. Here you get to talk to the blue, Mischievous alien, and you’re sure to get a good laugh! Sit back and video chat with Experiment 626 as the mischievous animated alien turns the Galactic Federation upside down. Just when you thought it was safe to go back into the Monitoring Station for a friendly face-to-face, Gantu gets word that Stitch is on the loose and not where he’s supposed to be—yakking with you via satellite from his home in Hawaii. Seems like everyone’s favorite blue cosmic monster has “borrowed” Gantu’s ship for an impromptu trip. Thanks to powerful tracking devices, Crisis Command pinpoints his whereabouts and establishes interstellar communication. Stitch is happy to talk, tell jokes and play games with all his new friends, despite knowing the Federation’s hot on his trail. After receiving an alert that Gantu’s boarding the ship, our furry little friend needs to find his space cruiser fast. 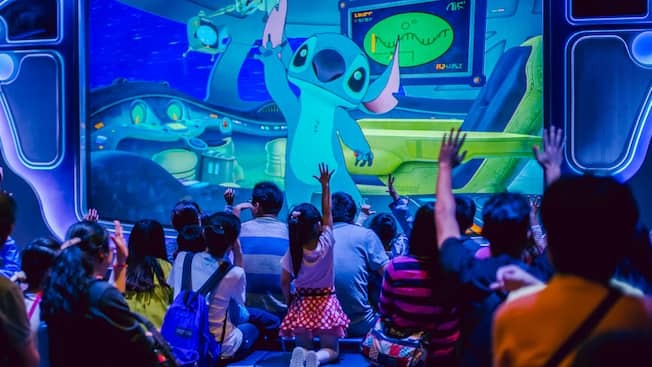 Will Stitch escape and return home to his “ohana” before the Captain closes in? Find out by embarking on an extraterrestrial trek that takes you from one end of the wacky galaxy to the next! Stitch Encounter continues the adventures of characters that debuted in Disney’s hit animated film, Lilo & Stitch. Other versions of the popular Tomorrowland attraction are featured at Hong Kong Disneyland, Tokyo Disney Resort and Disneyland Paris. By incorporating state-of-the-art animation and digital puppetry with unscripted dialogue, each out-of-this-world show is unique based on specific interaction with its individual audience—no 2 experiences are the same.